Solo travel is great. It's the ultimate adventure; the purest experience of the world that you can possibly have. It's a challenge, and it's a thrill. Everyone should do it. But it's also kind of a pain. I've done a lot of travel in my own company and I've come to realise there are certain dilemmas that are unavoidable when you're flying solo, certain everyday conundrums that everyone will have to negotiate. Most days, this won't be a problem. Most days you'll just find appropriate facilities, and just go. It's the travel days that present the issue, days when you're carrying your backpack or suitcase, plus your day pack and all your other bags of accumulated souvenirs. You can't just leave that stuff out in the open while you go to the toilet. You can't ask someone to watch it. And you can't drag it all into the toilet cubicle with you… can you? The answer is yes, you can, if you have to. It's unpleasant, but necessary. You're travelling on your own, and you want to go for a swim at the beach. Who's going to watch your stuff? Because there's no way you can go to the beach with nothing – at the very least you'll need a room key and some clothes. That's the trick though: take the bare minimum. Don't take a phone if you can avoid it. Leave your wallet at the hostel or hotel and pick it up later. Then, place your gear close to the shore, on a quiet part of the beach so you can keep an eye on it, and get splashing. First-time solo travellers are always a little intimidated by the thought of going out to eat on their own, which is understandable. You feel like everyone is staring at you, wondering where your friends are. But the truth is no one really cares if you go out to eat on your own. This is particularly true if you stick to casual restaurants with a high turnover of tables, where no one will even notice that you're reading a book and having dinner for one. For me, this is the opposite. While as a solo diner I would avoid high-end restaurants and opt instead for the cheaper, more casual eateries, as a solo drinker I'd go to the big end of town. Head to a classy cocktail bar and you can pull up a stool and take your time with a drink and no one will bother you. Go to a divey pub and you'll feel a little out of place sitting there on your own while groups of backpackers do Jaeger bombs. Couples have it good, in some ways. When it comes to finding a place to sleep, they can split the cost. Two paying for a double room will always be cheaper than one paying for a single. For solo travellers, the hostel is your friend. Get a bed in a dorm room. Splash out, occasionally, on a private room when you want a break. House-share websites are also handy for those who want a few of the comforts of home but can't afford to rent an entire apartment. There's not a solo traveller alive who enjoys being slapped with a single supplement – the extra money you'll have to pay if you want a room to yourself while on a tour. This is a dilemma though, because you don't have to pay it. You could choose to share a room with a fellow passenger, ensuring you both pay the same amount as everyone else. That, to me, is the best option, and if there's an odd number of passengers you may just find yourself with a private room anyway. Every single day, as a solo traveller, you will be forced to make a snap judgement on someone's character. Is this person trustworthy? Is this person sane? Is this person my friend? Even if you're just going for coffee with a fellow traveller from your hostel. Even if it's just a drink with someone you met over social media. Every day will involve a decision, and you will occasionally get it wrong, as I have: I went on a long-distance bus ride in Turkey with a Canadian guy who turned out to have a criminal past; I had lunch in India with a group of jewellery smugglers. You learn from your mistakes. 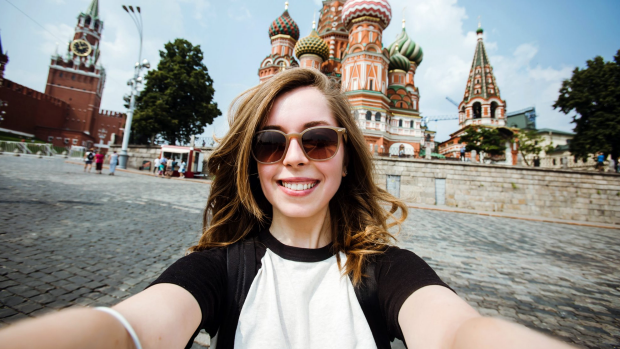 Yes, you could just take selfies everywhere you go, and plenty of people do. But then you'll just have a lot of photos of your enormous head with small tourism attractions placed in the distant background. The other options are to take photos without you in them – shocking, but possible – or to ask other kindly tourists to snap a pic of you in front of somewhere interesting. Always look for the people with the biggest cameras. Here's something solo travellers aren't always comfortable with: explaining why they're solo travellers. There's still a stigma in some parts of the world about this, and a legitimate fear that you'll be treated as some sort of failure if you admit you're travelling on your own. There's also a danger factor in some places in admitting you don't have any back-up. You can deal with this in several ways. You can wear a fake wedding ring, and say your partner is doing something else today. You can make up a story about friends you're meeting later. Or, you can own this thing and proudly say that you're seeing the world solo. Each is a totally reasonable approach. What are the everyday dilemmas you've faced as a solo traveller? How did you solve them?